Fresh market production of melons has been an important crop for NYS growers for many years. 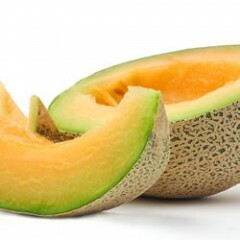 Cantaloupe are predominantly the main type of melons grown, but Honeydew, Crenshaw, Watermelon and Gallia types can also be grown quite nicely in our climate. Recently, "personal" or "ice box" types of melons, which have been bred for individual consumer use are much smaller (2-3 pounds) and have become favorites of consumers at roadside stands and farmers markets. Nearly all the melons grown in NY are produced on raised beds mulched with black plastic and drip irrigation. Fusarium wilt, Powdery and Downy Mildew and Gummy Stem Blight remain the main disease issues with these crops. Striped Cucumber Beetles and aphids remain the major insect pests. A product called LandSpring was labeled in NY back in July of 2017 and may help reduce transplant shock of certain crops. Learn more about what it is and how it works. 2015 Melon Variety Trial Photo Slideshow!